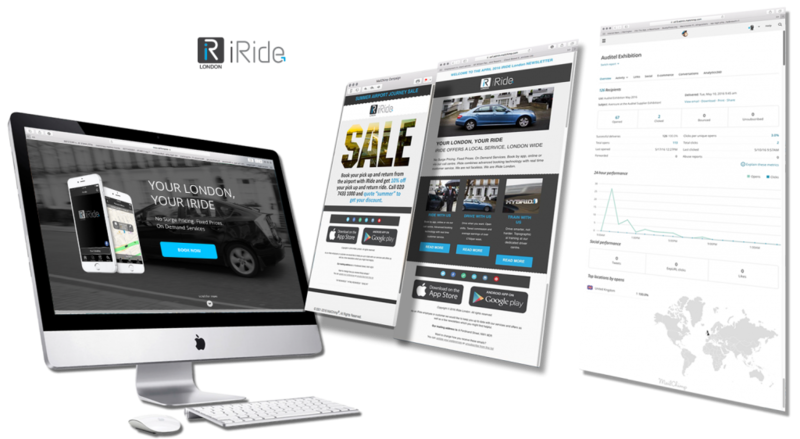 THE BRIEF: iRide had a nice logo, a good looking website, plenty of people using their app and lots of drivers. But they weren’t getting enough traffic via the search engines. Keyword and competitor research – We looked closely first at their competition, and what keywords they were targeting. From there we broadened the search to compile a list of 207 relevant search phrases and 13 competitors. Optimisation – We then organised our key phrases into categories and chose half a dozen we wanted to target. Next, we created and optimised a page for each of those groups of keywords. Thos keyword tables are also referred to when using their social media accounts. Email campaigns – Next on the list was creating email templates for drivers and customers in MailChimp. These email campaigns are then used to remind customers they are there, send details of offers and cross-sell. They are also great for keeping in contact with their drivers. Reporting – Each time an email campaign is sent, we use the Mail Chimp reporting to monitor it’s success and see where it can be improved for the next time. THE RESULTS: More users of the app and surges in traffic to the site when mailers are sent to customers. Drivers were recently able to vote on options for their pay structure via a simple campaign and they are kept up-to-date and reminded of any changes to company policy via the email campaigns. "Red Design's interpretation of our needs for our recent brochure surpassed our expectations. Their design ideas were extremely innovative... Many customers have since passed favourable comments..."